Five months ago, I had sought out RobZFitness in an attempt to regain my true self. I felt like a different person than what I was looking at in the mirror. Growing up, I was very active in sports and kept my body in fantastic shape. Once I graduated high school, life became very busy and the pounds started to pile on. Every couple of months I would tell myself that I would start working out again and would try to change my eating habits. Those attempts normally lasted a week before falling back in to the same routine I was in before. With my weight hovering over 200lbs, I made the decision that I needed professional knowledge on how to get myself to where I wanted to be. I needed someone to push me and make sure that I succeeded in reaching my goals. When I initially met Rob for my consultation, I quickly found out how bad of shape I was in. After a series of simple exercises, I could feel my stomach turning and knew that we were all about to see what I had for breakfast. From that moment on, I dedicated myself to make sure that I would never feel that way again from such a light amount of activity. I got right to work, three times a week with Rob and Taylor, and having them push me harder than I thought I was capable of. 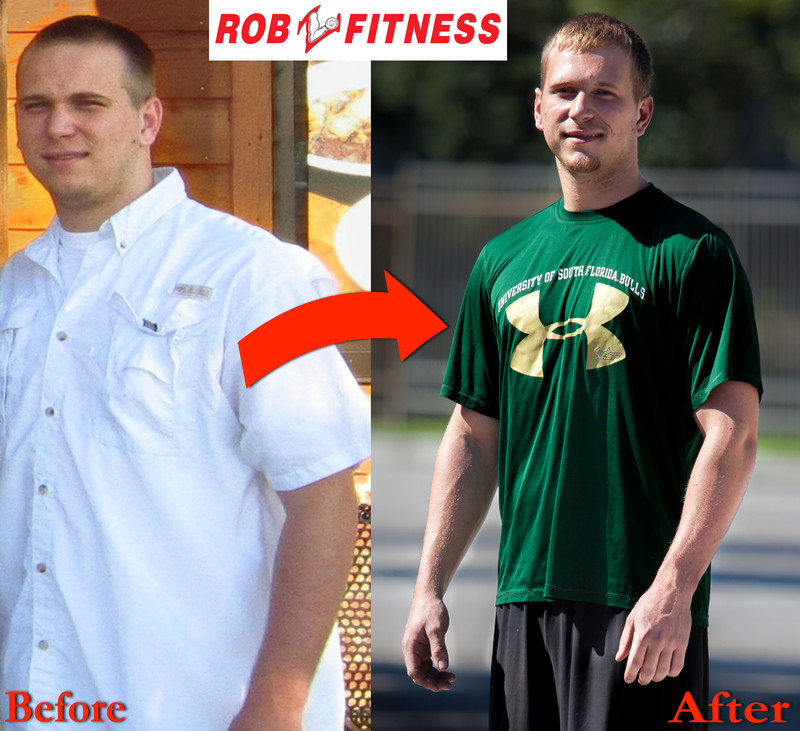 I also was able to completely change my diet with Rob’s simple eating plan. I not only began to look different, but I felt even better. Coming to RobZFitness has been a life altering experience. I am stronger than I have ever been, while also getting my body fat percentage as low as it has ever been. To date I have lost 25lbs of body fat and increased my lean weight by 8lbs. My body fat % dropped from 21.5% to 7.5% and have improved mens BF ranking from 23% to 89%. I have made myself healthier and much more energetic in the process. I now have been able to make exercising an important part of my life and will continue the path that I have started at RobZFitness. For somebody considering personal training with Rob at RobZFitness, I would encourage them to stop thinking about it and start being about it! Time is going to go by whether you make the effort or not. Which person do you want to be several months from now, the same person or the improved you? I want to thank Rob, Taylor, and Sam at for helping me realize my potential and guiding me on this amazing journey.